Waterfront dining is a must-do when visiting Lake Macquarie. Freshly caught seafood and famous Hunter wines are stars of the local menus, with tastes ranging from modern Australian right through the spectrum, to Asian and European cuisines. 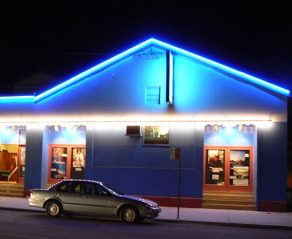 Lake Macquarie's clubs and pubs combine the best of dining and entertainment, with live music several nights a week. During the warmer months, be sure to attend Music in the Podium, a series of free outdoor concerts held on the Warners Bay Foreshore November through March. Diners can enjoy the classic architecture of the house and magnificent views complete with sculptures, huge Port Jackson Figs and incomparable lake vistas. Rathmines Memorial Bowling Club is ideally situated on the shores of Catalina Bay on Lake Macquarie, NSW and is a short 90 minute drive north of Sydney. Relaxed Dining experience with good food and service at a fair price. The Lakehouse is a stylish new waterfront cafe set amoungst the gum trees at beautiful Murrays Beach.